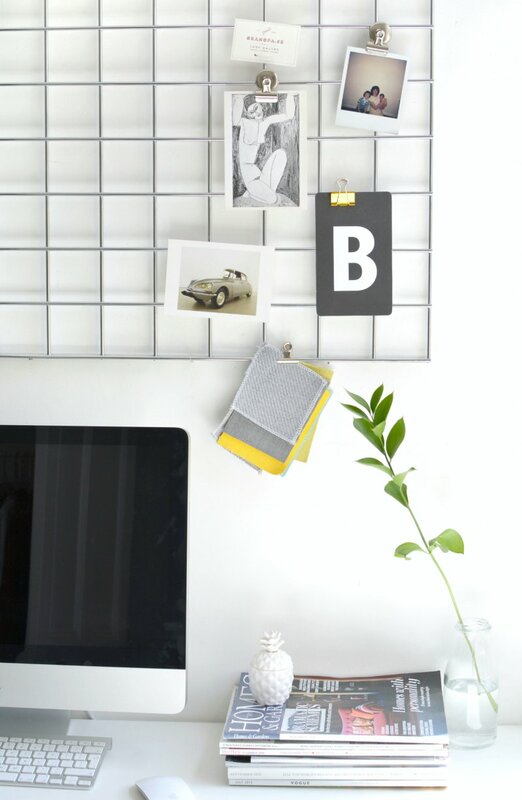 do you remember my grid shoe organiser from a few weeks back? well I mentioned I'd originally bought it for another purpose and this was it! I used to have a gallery wall of pictures around my desk but I grew tired of the layout and decided to give my home office a little makeover. 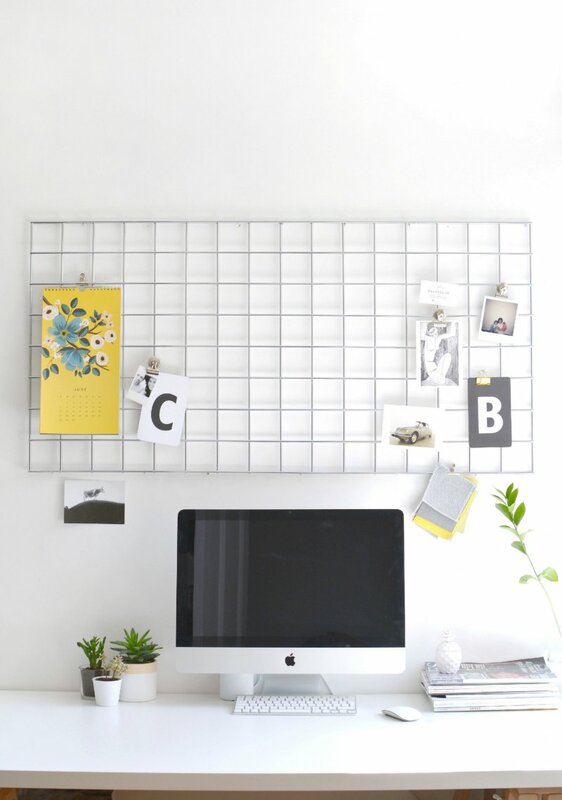 I'm a big believer that every office needs some kind of memo board and I wanted to create a feature out of mine. 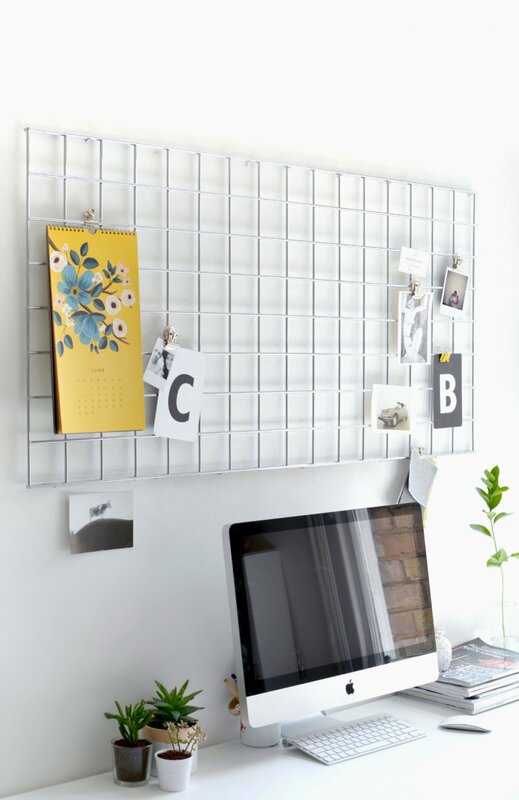 I thought the wire mesh would be perfect for the job plus it has an industrial feel that I'm really into right now..
you can buy brackets or hooks to hang it, you'll just need to drill a series of holes first- so grab a power drill and spirit level to make sure it's straight! the mesh itself is available over here. 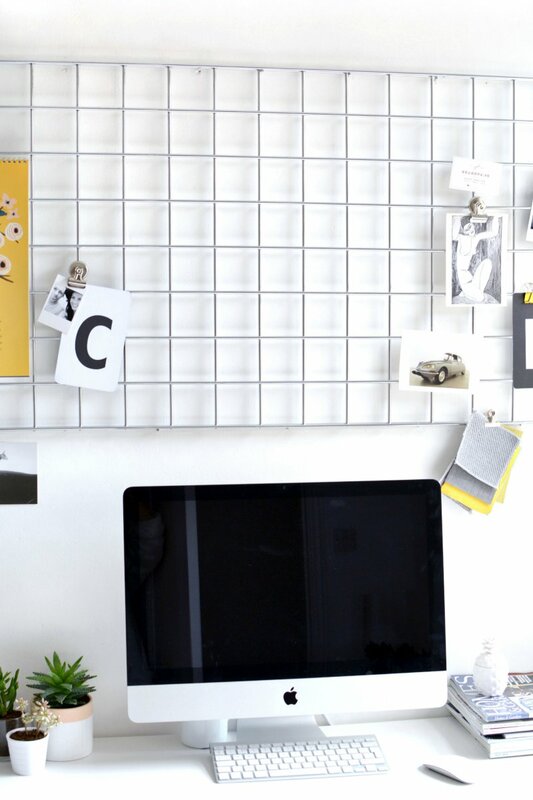 it's a great way to display my to-do lists so helps to keep me organised, I can also use like a mood board to display things that inspire me. 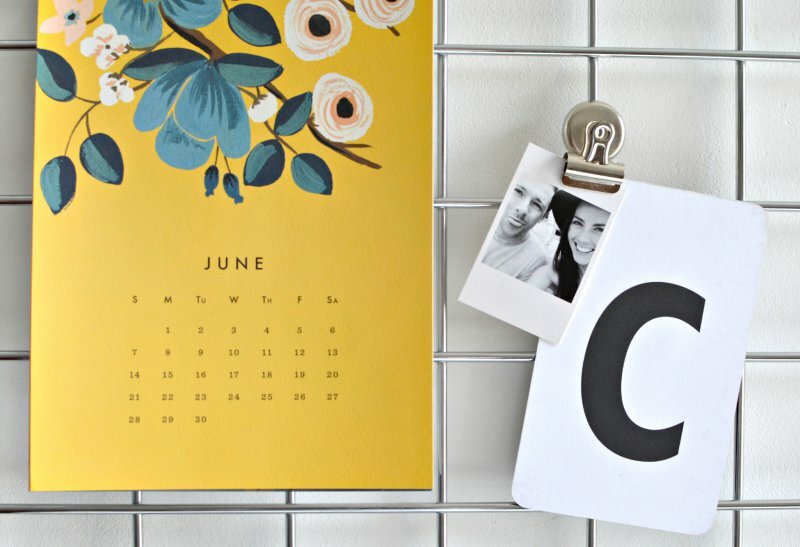 as it's metal it's easy peasy to attach images with magnets and bulldog clips! add some hanging hooks and it would also double up as brilliant craft storage, you can hang everything from threads to scissors... have I sold you yet? I'm really happy with how it looks, overall my desk is a lot less fussy than it was and it helps me focus when I get down to work... stalking kit harington on google image search, cough. do you like my new look home office? It looks great. Really simple and clean. This looks awesome!! Such a good idea!! I would have never thought of doing this! I can't wait to move out so I can decorate like this. This is a great idea! Btw, your calendar looks amazing. This is such a good idea! you can move stuff around and keep the wall nice and clean. Thanks for the Idea. You are the Diy queen! This is the chic minimalist look I always strive for with my home but then I can't help just adding loads of clutter! This is such a great idea and looks incredible too! It looks so good! Need to try this! Such a brilliant idea! I love it! How did you attach this to the wall? hey this is great! what did you use to hang it up? I live in a dorm and can't drill holes in my wall. Is there another way I could hang this up without drilling? I'd love to know how you fixed this panel to the wall, it looks far more elegant than other solutions I've found online. What size is the board in this story? Thank you for the lovely idea. I have just purchased mine and sprayed painted it metalic gold and looks fab. The only concern I have is that the brackets I purchased with it is very long...makes the whole thing stand right out from the wall at a distant of 7.5cm. May I please ask (as I can't see in your pictures) what brackets you have used?